Giuseppe Verdi wrote his Messa da Requiem in memory of a great man. As fate would have it, the Grand Rapids Symphony used it to bid farewell to a great woman on Friday. Philanthropist and arts lover Helen DeVos, who died in October, more than any single person, made the Grand Rapids Symphony what it is today. Though the Grand Rapids Symphony finalized its 2017-18 season nearly a year ago, it happened that the orchestra’s scheduled performance of Verdi's Requiem would be the first concert in its Richard and Helen Classical series following the death of Helen DeVos, who served nearly 20 years on the orchestra’s board of directors. It’s no surprise that the Grand Rapids Symphony dedicated performances on Friday and Saturday, Nov. 18-19, to her memory. Friday’s performance was glorious, and it ended with a full 5 minutes of applause following the 85-minute performance, which repeats at 8 p.m. Saturday, Nov. 19. A total of 275 musicians on stage, singing and playing their hearts out, rattled the rafters with each reprise of the dramatic “Dies Irae” or “Day of Wrath.” But those same musicians also sent chills through the auditorium with the softest pianissimos beginning with the almost imperceptible opening passages of the setting of the Latin Mass for the Dead in the Roman Catholic liturgy. It’s Music Director Marcelo Lehninger’s second season with the Grand Rapids Symphony, but the performance, in fact, was Lehninger’s first collaboration with the Grand Rapids Symphony Chorus. The Brazilian-born conductor has said Verdi’s Requiem is one of his all-time favorite works to conduct. It quickly became apparent that his affection for the work is genuine and heartfelt, and his understanding of it is insightful. The performance offered the promise of wonderful things yet to come in the choral and orchestral repertoire in DeVos Performance Hall. For openers, it was a big leap forward from the Grand Rapids Symphony’s last performance of Verdi’s Requiem in May 2010. For that season-ending concert, the Calvin College Capella joined the Grand Rapids Symphony Chorus to fill out a chorus of 150 singers. For this performance, Capella joined the Grand Rapids Symphony Chorus to put 180 singers on stage. That’s necessary. Because Verdi composed a big work for double chorus and orchestra with four bassoons and eight trumpets four onstage and four antiphonal. In fact, there are 16 brass in all, including a cimbasso, a bass instrument though with a more direct and penetrating sound than a tuba. A pounding bass drum comes back again and again. Conductor Hans von Bulow, glancing through the score of Verdi’s Requiem prior to its debut, famously dubbed it “an opera in ecclesiastical robes.” It is an opera, minus the costumes, makeup and special effects. History also records that the first time Bulow heard it many years later, he was moved to tears. In the “Dies Irae,” Verdi unleashes the furies of hell to chase after the faithful with pokers and pitchforks. In the “Sanctus,” he who is blessed and coming in the name of the Lord appears to be making the trip aboard a pirate ship. Four soloists, each accomplished Verdi singers, were thoroughly impressive on Friday. Verdi assigns the bass the bleakest passages. Bass Raymond Aceto was positively menacing with a commanding, though seemingly effortless, delivery. Each of his terror-filled recitations of the word “death” in Latin galvanized the audience. Tenor Carl Tanner, substituting for the previously scheduled Anthony Dean Griffey, sang with formidable voice but also one with notable sweetness in his softest passages. In his Requiem, Verdi seems to ask the most of the mezzo soprano. Suzanne Hendrix was up for the challenge, singing the “Liber scriptus” with a rich, round voice of Wagnerian proportions, possessing the heft of a contralto and the clarion notes of a mezzo, all in one package. Julianna di Giacomo, a soprano with soaring height, carried the day with the fear and trembling of the final “Libera Me” in a powerful scene for soloist and chorus. Though the works ends softly, it does not disappoint. 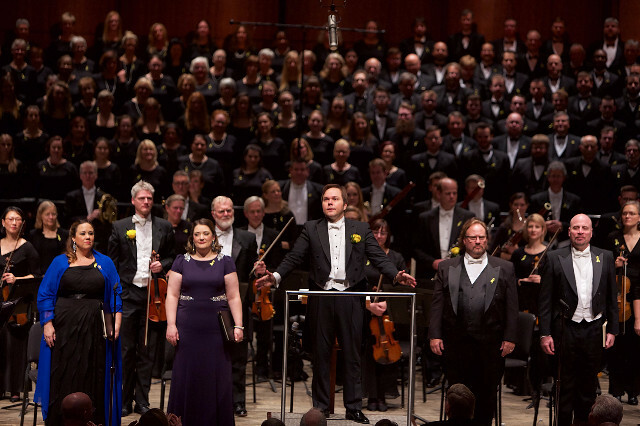 Verdi’s Requiem will return again to the Grand Rapids Symphony stage. It’s a work that will last forever. For that matter, in West Michigan, so will the memory of Helen DeVos.